It's always hard to show some sort of scale when comparing the size of a hummingbird to something else. I think the leaves on this vine do a great job. I usually see the last hummers at the State Botanical Garden of Georgia around October 2-3. I'm really gonna miss these guys!! 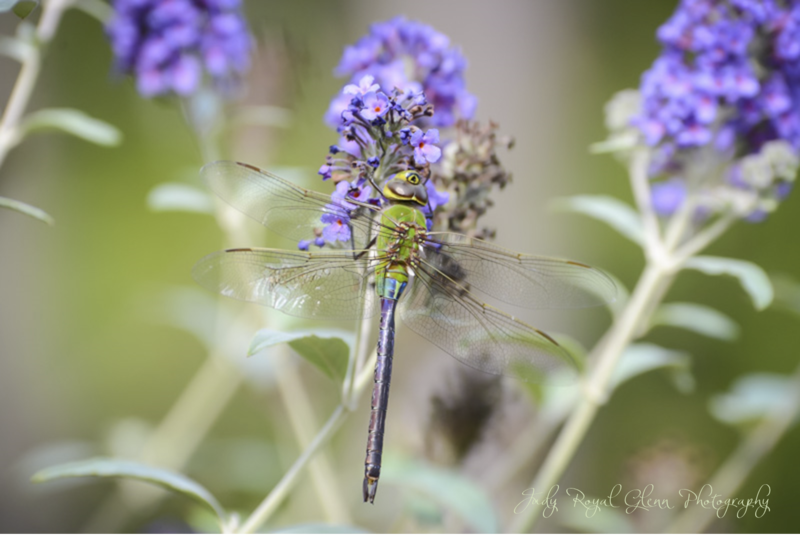 This is a continuation of a story about two miracles that occurred at the State Botanical Garden. 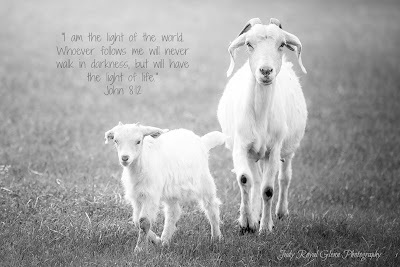 If you missed the exciting story of the two miracles, it can be found here . 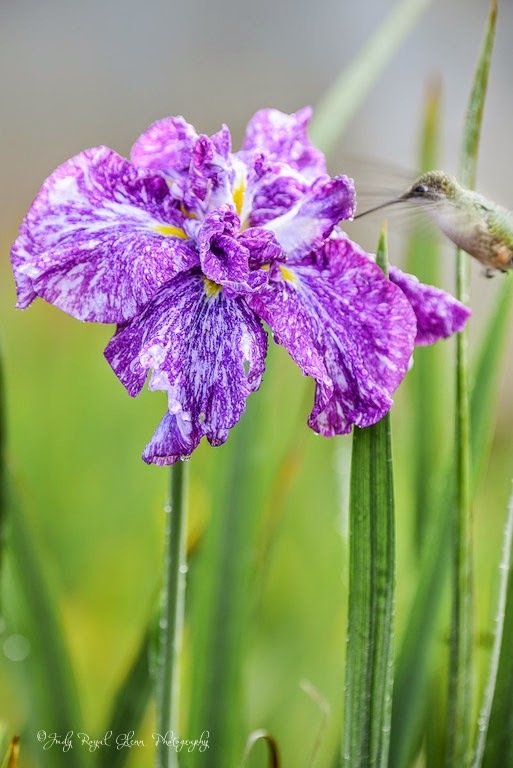 Four days later I went to see if I could capture another photograph of the hummingbird feeding off of the iris. I got to the botanical garden early and ran into Shelly in the parking lot. I asked him about the iris, and he told me the bloom had died, and he picked it off. He said there must have been another bloom underneath it because a new bloomed opened. 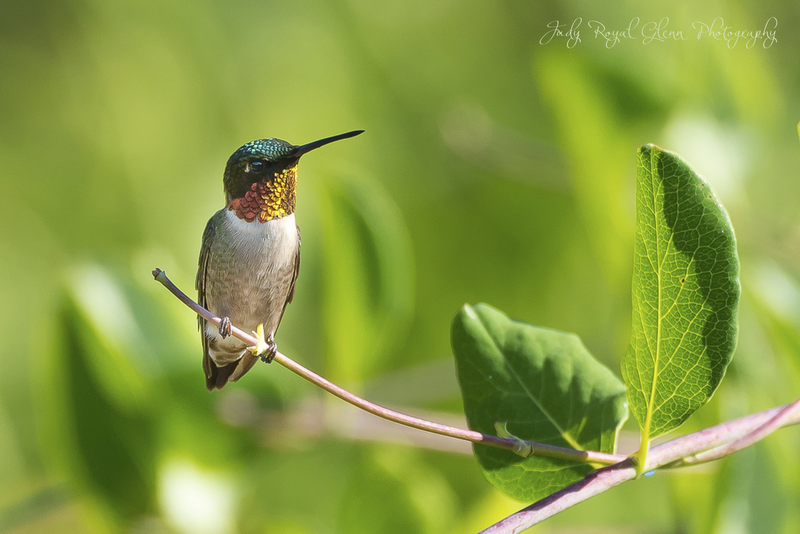 I was excited about photographing the new bloom, and I hoped the hummingbird would come back. I got all of my equipment set and waited. It began to drizzle a little bit, but I was determined to stay. I waited about 15 minutes in the rain and for some reason I did not have my face to the back of the camera when the hummingbird let her presence be known by the roar of her wings. But it was too late. She buzzed around the flower very briefly then flew away. I was so disappointed that I did not get the shot. I waited for probably an hour and a half more and she never came back. It had been raining lightly the whole time but luckily I had something to throw over my shoulders to keep me dry. I found another worker I know and told her Shelly should get the first bloom and press it for Jason’s mom. I left disappointed, but I think I may have one more try before the bloom is gone. I went back today, and the bloom had closed and wilted. Again, I was disappointed, but I knew ahead of time that when the Lord allows me to photograph His divine appointments, it has always been a one-time shot. I am thankful for the two miracles He allowed me to document, and I will never forget the story! 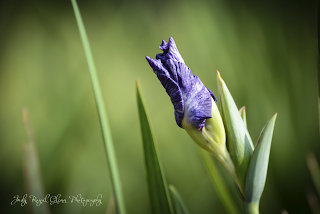 This is a photograph I took last week of "Jason's" Japanese Iris before it bloomed. 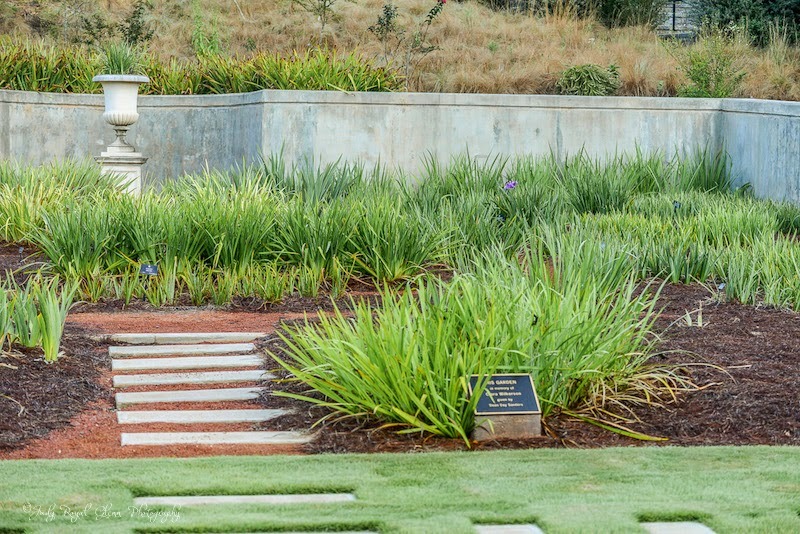 If you missed the story of the two miracles at The State Botanical Garden of Georgia, click here to read the story! Just this week I learned about a neat story. A curator, Shelly, at the State Botanical Garden of Georgia, knew about my blog and thought I would like to hear a story. He wanted to show me something in the Iris garden, so I followed. He walked me to an iris that was budding and about to open. He told me about the flower and the amazing story behind it. 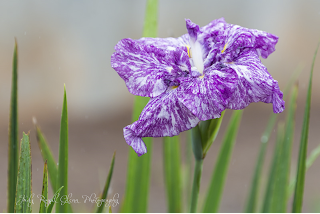 What could be so neat about an iris in the garden? This story is of one miracle that turned into two. The story is special because of a young man named Jason who used to work in the garden. The Japanese iris was his favorite. Jason was killed in a car wreck on September 18, 2012. Shelly took Jason’s mom some iris plants and planted them at her house the month after he died. Shelly told me Jason was the greatest person you would ever meet. I was very touched by the story and knew this was one of God’s many miracles that He still performs today. 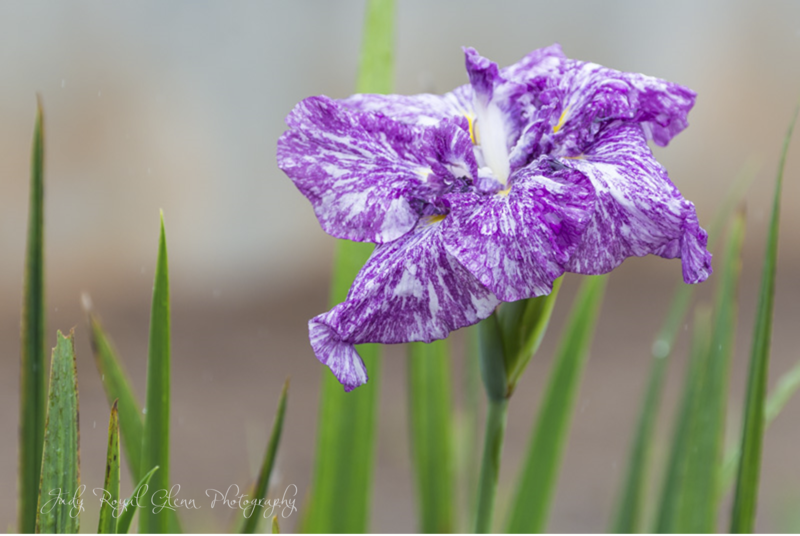 I wanted to photograph the iris and put the story on my blog. When I first photographed the flower, it had not opened yet. I came back another time and again it had not opened. Today, September 20th, 2013, I noticed the iris had opened. I was so excited. The flower was beautiful, and its petals were decorated with dew. I knew the perfect light was coming, and I kept saying, “It’s coming....it’s coming.” I needed to be ready, so I quickly set up my tripod and pointed the camera at the iris. I couldn’t miss this shot. I set my camera to have a two second delay after I clicked the shutter, so I wouldn’t cause any vibrations. After the camera captured the photograph, I looked on the back of the camera to see the photo I captured. I did this several times and used several different angles. I realized the second miracle as I looked at the back of my camera. It had happened without any sound or warning. The miracle was the biggest blessing to me, and I started to cry! As I looked at the camera, I was in disbelief. Did I see what I thought I saw? Yes, I did…..it was a hummingbird feeding from the flower! Calculate that miracle with numbers: me setting up my camera on a tripod with a two second delay, me never seeing or hearing the hummingbird, and in those two seconds after I pressed the shutter release, a hummingbird slipped into the photo while I was photographing the first miracle! I just sat there and cried. I did not feel worthy of capturing the photograph and said so out loud. The Lord knows hummingbirds are my favorite bird to photograph. I believe I can recall thinking how it would be neat if a hummingbird came by and it did. A short time later Shelly walked up. He said the flower had bloomed the day before. I told him I had been crying, and then showed him the image on the back of my camera. 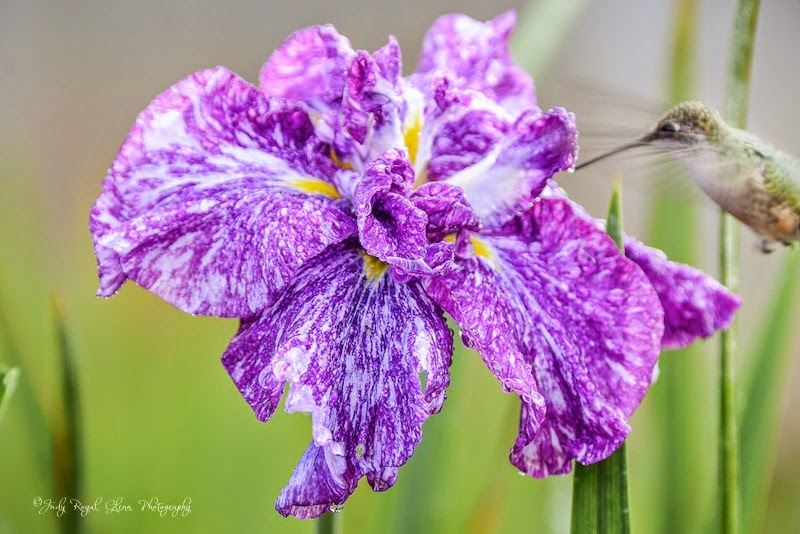 To add to the miracle, he said he has never seen a hummingbird in the Iris garden! He said he was going to call Jason’s mom, and I told him to please give her my e-mail. I want to print and mat the photo and give it to her. Shelly walked away and the next thing I know, he was bringing a few workers to the Iris garden. I had met two of the workers before and showed them the image. Shelly had already told them the story of the hummingbird. I wanted to learn a little about Jason. I found an article about the wreck and his page from the funeral home’s website. I cried as I read the sweet things friends and family wrote about him. I read about the great guy Shelly was telling me about. From what I read, he personally knew the Lord, so he is Heaven with Jesus experiencing an incredible life! I have a link to the newly updated story. 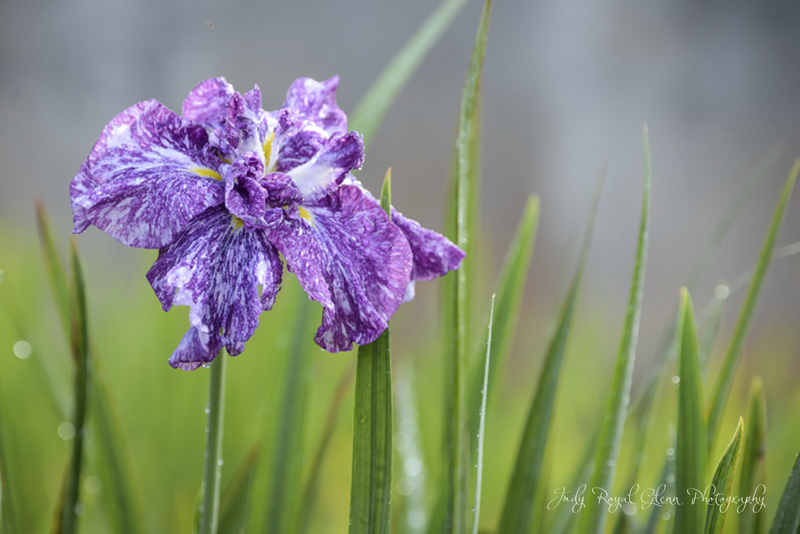 The Japanese iris did not bloom in September 2014. Click here to view the new photo and read the update. Through the glass of my lens, I get the neat opportunity to observe wildlife. 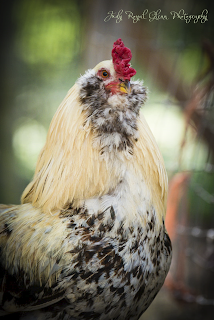 I use my telephoto lens, so I get an up close view of them. God's creatures are so unique and amazing, and I love spending time outdoors watching them. 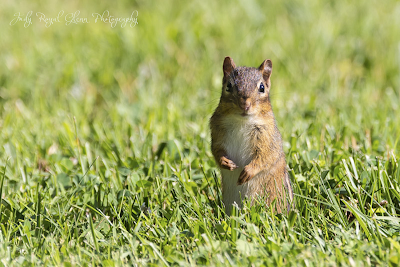 Chipmunks tend to show me their burrowing hole by making loud vocal noises directing me straight to their hole. 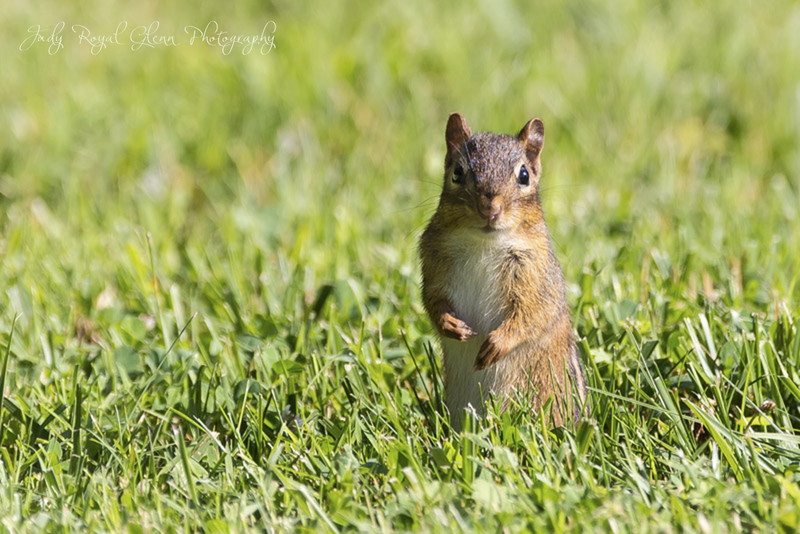 When I hear them, I set my tripod up and wait. 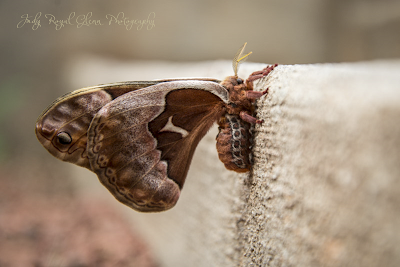 As I was walking down the stairs at The State Botanical Garden of Georgia, I found this little fellow on the steps. I guess it was alive, but it did not want to move. Since it was going to be still, I got out my camera and took advantage of the situation! 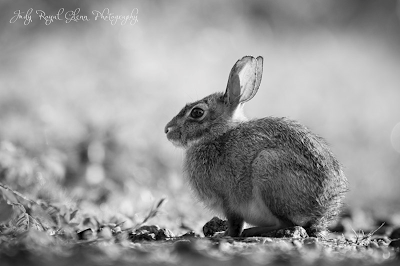 One of the keys to wildlife photography is patience. When I find a hummingbird's perch, I know he/she will come back time after time. 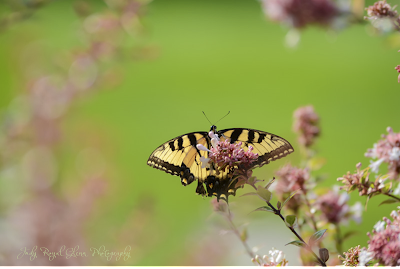 It seems like when I am waiting they may be visiting every flower before they come back because it takes so long. In reality, I know they are also perching on another favorite perch. Sometimes I only have to wait a few minutes, but more than likely it is 15-30 minutes or longer. It is a focused time of being still, quiet, and focusing on the perch while waiting. The wait is worth the result! 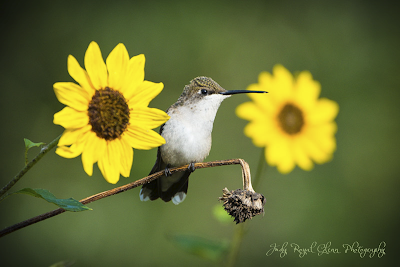 I think this is my favorite hummingbird shot to date.